Bay Area Lyme Foundation today announced that the Foundation is the first to offer free tick testing for residents of the U.S. Testing is available through a partnership with Nate Nieto, PhD, Assistant Professor, Department of Biological Sciences, Northern Arizona University and his lab. Bay Area Lyme Foundation hopes to use this crowd-sourced data as a vehicle for gaining a greater understanding of the geography of tick-borne diseases in the U.S. If successful in accumulating data, it will be the first crowd-sourced study of its kind. “A major challenge for the Lyme disease community is understanding the prevalence of Lyme disease bacteria in ticks throughout the U.S., so that physicians and residents can be appropriately vigilant to the symptoms of the disease,” explained Laure Woods, President and Co-founder, Bay Area Lyme Foundation, who conceptualized this idea, and provided funding to Bay Area Lyme Foundation through a grant from the Laurel Foundation to cover the initial costs of the tick analyses. “With this effort, we intend to make it easier for people who have been bit by ticks, particularly in geographic areas where Lyme disease is not yet recognized as endemic, to understand their potential risk,” added Woods. This free service is designed to offer insights into the pathogens carried by ticks, and the results, in addition to any symptoms, should be discussed with a healthcare provider. Results from the tick test are not meant to be a diagnostic and individuals should discuss any symptoms or changes in health status with their physicians, as some tick bites will not transmit agents that cause disease. “This new initiative has the potential to gather extensive data on the geographic distribution and future expansion of ticks carrying pathogens that causes various diseases in humans, and could allow us the opportunity to better understand where in the U.S. we are at a greater risk of acquiring these diseases,” stated Dr. Nieto, who cited climate change among other reasons the risk of acquiring Lyme exists in areas outside the known endemic Northeast. Northern Arizona University will accept ticks from any state in the U.S. Ticks will be tested for 6 bacterial infections: Borrelia burgdorferi, which causes Lyme disease; Borrelia miyamotoi, which causes tick-borne relapsing fever; Anaplasma phagocytophilum, which causes human granulocytic anaplasmosis, Ehrlichia chafeensis, which causes human monocytic erhlichiosis, and Rickettsia ricketts, the agent of Rocky-mountain spotted fever, and the protozoan pathogen, Babesia microti. Results will be available within five business days of receipt based on estimated volumes, and the data will be reported to the sender by email, as well as mapped, categorized and recorded. There is a great misconception that Lyme is easy to diagnose due to the bull’s eye rash. However, the rash (Erythema migrans) only occurs in approximately 70-80% of infected persons and only a subset of erythema migrans rashes resemble a bull’s eyei. In fact, the current “gold standard” diagnostic for Lyme disease misses up to 60% of cases of early stage Lyme disease. Therefore, knowing the general symptoms of the first stage of Lyme disease (and other tick-borne pathogens) is critical in reducing the burden of disease in people. Typical symptoms include headaches, flu-like illness, joint pain, fatigue, and sometimes a rash that has a few different shapes including one which may look like a bull’s eye centered on the tick bite. Great deal! Free tick test in return for them entering your tick’s results into their database. They should also be testing for Bartonella. I wish I would’ve kept the tick that bit me and had it tested. I didn’t know that some people don’t get early symptoms like the rash or flu-like illness. I didn’t know the Lyme tests were so inaccurate. I didn’t know doctors were so reluctant to treat Lyme. I learned the hard way. Great that testing will be done on the tick. Rockin Cowgirl. I didn’t know that a Tsunami had hit me when I first found out I had Lyme. I though, now I know hat it is, so all we have to do is treat it and it will only be a bad memory. I now see new Lyme victims all the time. They have NO IDEA of the Tsunami they are facing. The sooner you get treatment, and the more extensive, it is, the better the chance for remission. Some of these new patients are taking prednisone. Prednisone almost killed me. The new people are just like I was in denial The denial is because of lack of awareness. Unacceptable. Hi, I sent my tick (from Wayland) in a few weeks ago and still haven’t heard back. How can I confirm whether you received it? This is not our program. Recommend you contact the sponsoring organization. (Contact info in the post above). I smothered the tick in Vicks vapo rub before removing it. Can you still test the tick successfully now? 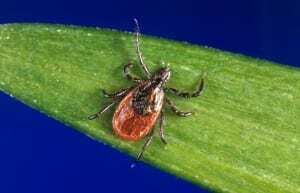 Is there any labs in Ontario or Canada that will test ticks? We are looking to send off some ticks our canine patients are picking up in the bush.